A complete solution for industrial data communication and management! Smart Gateways are the most powerful and flexible communication protocol converters, bridges, and data concentrators available. Protocol Bridge - Read/Write data between up to 16 simultaneous networks. Virtually unlimited data capacity. Data Logging - Store time-stamped information in choice of file formats. Store data locally, on a network drive or in the cloud. Alarm Notification - Send email or text messages. Highly customizable alarm triggers and list of recipients. Reporting - Generate text or CSV reports. Send reports or data logs as email attachments, or store on any accessible drive. Remote Access/Control - Embedded web server provides ability to view and change data values/states via web pages. Virtual HMI - Embedded Web Studio runtime provides HMI functions, including sophisticated alarm managment, real-time trending, remote SQL database interface and more. 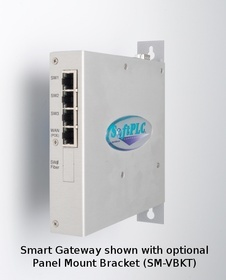 Smart Gateways are ideal for moving data between equipment controlled by different vendors, providing a path for staged migration from older technology based on proprietary networks to new and ethernet-based systems, or combining data from multiple networks to a single ethernet/cellular channel for data analysis or other high-level systems, plus many other applications. Note: Smart Gateway uses TOPDOC NexGen software for configuration. A free TOPDOC NexGen license is included with your first Smart Gateway purchase! All Smart Gateways include all supported serial and ethernet protocols as standard, configurable in any mix. If you desire support for Allen-Bradley Data Highway Plus (DH+), Remote I/O (RIO) and/or CAN, these must be factory installed - specify them above for COM5 and/or COM6 options. 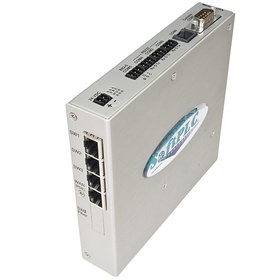 COM6 options (except the phone modem) require purchase of the SM-COM6CBLTB to provide a terminal block interface for field wiring. 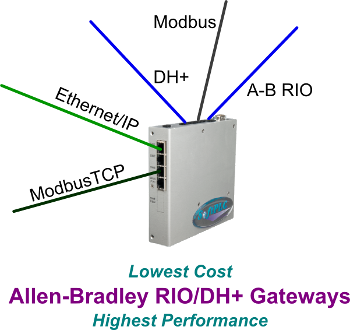 The Gateway Size only applies if you are using ModbusTCP Master, Ethernet/IP, A-B RIO or DH+ protocols. Select the Lite (LT) version if you are not using these protocols.